Meet Sara Schmidt ... for Real! Help Sara out with her newest book! There is a post from a long time ago that I mistakenly identified someone else as Terry Doran. Even though I changed the information, that post still gets a lot of activity with questions and comments about Terry. 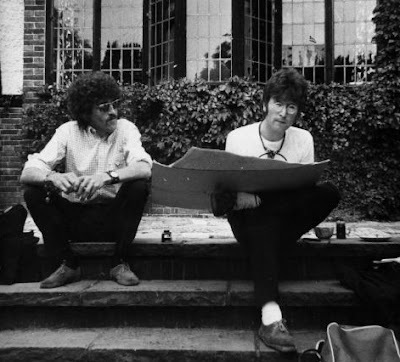 So I thought it was about time to post a REAL photo of Terry Doran (with John Lennon) so that viewers can actually comment about Terry under a photo with Terry in it. This blog is to highlight photos and stories of people who have met the Beatles in person. And while fan taken photos are my favorite, I also like to include vintage fan photos and other photos that show the Beatles meeting fans. The idea behind this blog is to follow in the footsteps of the great Beatle fanzines of the 1970's & 1980's such as The Write Thing, The Harrison Alliance, With a Little Help from my Friends, Paperback Writer, etc etc. Photos and article from those publications and others are reproduced here to preserve the history of the fans who met one or more Beatle in person. If you have ever met one of the Beatles and have a story or pictures to share, please contact me, Sara, at Starshyne9@yahoo.com. I love fan photos. These photos are from my collection, which spans 20 years of online photo collecting and scanning books. I do not claim any copyright on most of these photos or stories. Some of them are sent to me and published with permission. Others are scanned from magazines, books and found in various places online. I do not watermark photos that I place on this blog because I do not own any of the photos. These photos are on this blog in an attempt to preserve the history of the Beatles. If you own the rights to a photo and wish to have it removed from this blog, please contact me. photo taken off a T.V.